Ju 87R-2 with desert camouflage. 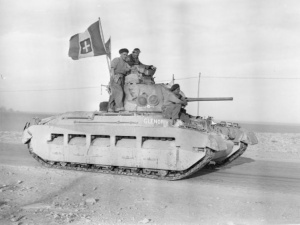 After the Battle of El Alamein in July 1942, both the Axis and Allied forces disengaged from major conflict in order to give themselves a chance to refresh and regroup. However, as the Germans and Italians desperately strove to prepare to strike at British lines, the supply situation had reached a point where Rommel’s hand was forced. Fearful of the growing British forces in Egypt, the DAK and the Italian Commando Supremo made the decision to strike while they still could. Above the desert sands the battle did not pause; it intensified. Daily battles of dozens of aircraft fought for control over the blue sky and the white sands of the Libyan and Egyptian deserts, spanning from the sea of the Mediterranean, where Ju 88 A-4 bombers harassed the scrap iron flotilla’s of the allied navies bringing supplies to the front, or when FAA aircraft and Wellingtons from Malta, or further afield, struck crucial supply convoys headed to Tunisia. The air battles over the desert were often fierce, with a cut and thrust between what were, by now, very experienced forces. While Allied Spitfires, Kittyhawks and Hurricanes whirled and battled with the Bf 109 E/F’s and Bf 110’s of the Luftwaffe, the harassment of ground forces continued. Ju 88’s and Ju 87 bombers made daily targeted attacks on allied airbases and on key defensive positions or supply dumps. Meanwhile, the Allied Desert Air Force maintained the growing pressure they were placing on Axis supply lines, flying deep into the desert and attacking the long convoys of trucks and other vehicles. Here, the long range and endurance of the British and US attack and bomber aircraft laid waste to the poorly protected supplies; Bostons, Mitchells and Beaufighters attacked with bombs, rockets and guns. 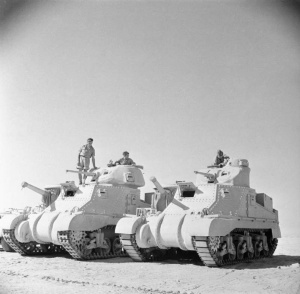 M3 Lee and Grant Mk.I of the Western Desert Force (later XIII Corps). Forming a north south line from the coast just west of El Alamein to the endless sands of the Qattara depression, Montgomery’s defensive line was a carefully prepared trap. Using intelligence gathered from Ultra decrypts, he established his forces in such a way as to provoke Rommel to attack his static defensive positions. Rommel on his part obliged, attacking the southern sector of the British line, however from the onset of the attack, the German and Italian forces were in trouble. Allied aircraft, forewarned and prepared, launched devastating low level attacks. Hurricane IID’s and Beaufighters struck at the flanks of the armoured columns. Matilda Mk.II captured by Italian forces (1941). The armoured units continued to advance, travelling through minefields and wire traps set up to slow down the German and Italian units. They were soon heading east, but had suffered considerable losses. Air attacks continued day and night, as did the constant barrage of artillery; as soon as a unit stopped, it would come under enemy fire. The troops were tired, and their vehicles groaned under the strain of continuous combat. The Panzer III’s and IV’s of the DAK suffered profoundly from the constant attacks from artillery and the Air. Allied air superiority was intensive, with several supporting attacks by Axis Ju 88’s and SM79’s unable to procure a breakthrough. Heading north and finally after coming up against the prepared positions at Alam Halfa, Rommel's tanks came to blows with Grant Mk.I tanks that had dug into ridge positions. While the Panzer IV F2’s long range guns retaliated against the M3’s as the Axis forces advanced, they suffered from the superior numbers and the return enemy fire of the well dug in Anti-tank guns. Montgomery’s tanks were not allowed to advance, and with that, the standard tactic of the DAK in using the fearsome 88 flak in support of it’s tanks, was neutralised. By the second of September, Rommel had realised he could not afford to continue his advance, hence resulting in his forces’ withdrawal. Continuous attacks by Allied bombers maintained a daunting tempo on the DAK, even after they had returned to positions they had formerly held. By the 5th of September, the DAK was in an even worse supply situation than before the battle had ensued on the 30th of August. The Desert Air Force had succeeded in destroying up to 400 enemy supply vehicles by some accounts, even if many previously belonged to the British. While the Axis forces managed to retreat relatively intact, they had not been able to lure the Allied armies into destructive, open battles. Thus, Montgomery maintained and improved his positions, and Rommel was now comparatively much worse, and would remain so until the end of the desert war.